Exploring, crawling, trying-to-walk, little lovebug. It’s definitely much more challenging to take the monthly pictures now! 1) Liv figured out how mobile she can be, and rarely wants to be held while we’re at home. I wrote about how I’ve become a little bit of a helicopter and am trying to relax, but the thought of her bonking her head on the tile -which has actually happened a couple of times now- scares the bejeezus out of me. We moved the pack n’ play back downstairs, so after she’s eaten, I can get about 10 minutes of her playing in there while I frantically run around the house, cleaning up or putting away dishes. It’s a lot of fun to see how much she’s learned and to watch her see and explore for the first time, but whew! It’s also exhausting. I knew it was coming, but for our at least one daily outing -it’s good to plan one adventure a day to get out of the house- it’s a nice break to wear her in the BabyHawk instead of chasing her around. Do moms with walking kids do this, too? She’s been scaling the couch, her crib and pack n’ play for the past couple of weeks, and will take a big step away when she’s feeling brave. She’s still trying to figure out the balance aspect, but once that happens, watch out! I’m so happy we baby-proofed as early as we did. 2) Eating! She continues to love to eat solid foods and I still love making and sharing food with her. 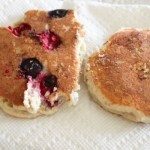 One thing I’d love to try this month: baby pancakes. Please let me know if you have any awesome baby pancake recipes. Breakfast is one of my favorite meals with her, because we’ll eat together. This month was also her first time trying a restaurant high chair, and she’s great in it, eating puffs and playing until the meal arrives. We look forward to our Friday Chipotle dates with her Uncle Kyle. and her little personality shows more and more each day. When I take her somewhere with me, I feel like I have a little friend with me and like she understands what I’m saying to her. She can wave “hi” and “bye” now, and can play “peekaboo”- all I have to say is “where’s Livi? Where did she go?” and she’ll crouch down and hide behind something. When she’s ready, she’ll pop out and I’ll say “peekaboo!” and she’ll get a kick out of it. Her belly laughs are my favorite thing in the world. 4) Baths. Liv loves taking baths- we play with the rubber duckies and I sing the only bath song I know (“Splish Splash, I Was Taking a Bath”) and we’ll splash and kick, but are there any fun bath time toys? I think siblings make bath time way more fun- Kyle and I used to crack each other up making bubble beards when we were really little. I’m trying to figure out if this month is when to retire the baby tub and let her take baths in the regular tub. Any mamas have advice? 5) She’s still making noises like crazy- my favorite thing is to see my mom whistle at her and Liv makes a high-pitched pterodactyl sound in response. She’s been saying “mama,” “dada,” “nana,” and “baba” for a couple of months, but just last week, she looked right at Tom and said “dada.” He wins. Sad trombone, haha. 6) I’m finally starting to get into some baby projects I had been neglecting. 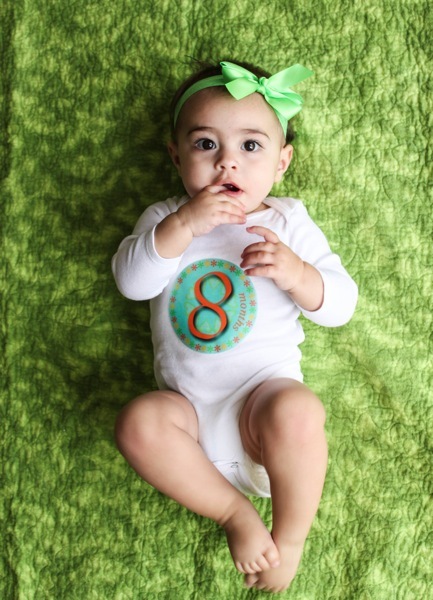 I finally donated a huge box of formula and newborn diapers to teen pregnancy outreach, put pictures in the frames I had set up in her room, and booked her 6-month photos… two months late. Better late than never, eh? 7) Separation anxiety is in full effect. Every time someone holds Oliv after I’ve been holding her, she looks at me, opens her arms and cries. I know it’s good for her to have other people hold her, but my heart soars little to know that she wants her mama. I’m happy for any snuggle sesh I can get, especially since she’s so active now. Oh my gosh, she’s soooo cute!! She looks like so much fun, I think it’s such a great idea to do these monthly updates. I’m hoping to do something similar next year when we have our first and make a sort of scrapbook out of it. I think you just need to find the ones you love! They do make clothes fit a little funny (ghetto booty on a baby is coo cute though) so you have to usually wear the next size up. Try Fuzzibunz, they are adjustable, not as bulky as most, and about $25 a diaper. Sunbabies is a great one too, they are a little bulkier but you can get 6 diapers for $40 so it’s not such a big investment if you just want to try ’em out, and they have the cutest prints!. Gina- I looooove your blog! I have never left a message on any blog before but I just found your website as I sit here and make baby food and now I’m at a standstill because I can’t walk away…haha. You need to put Liv in the big tub, fill it up about 1-2 inches let her go on here tummy and kick and splash, I swear she’ll love it! My little one just turned 7months and we started her in the big tub this week- best decision ever! We got some cheap little fish that can squirt water (off well.ca) and she can’t get enough. Just make sure you have a video camera ready. Have you let Liv try Quinoa yet? I just finished making some, it smells so good I can’t wait for my little one to try it tomorrow. Anyways, LOVE all the fitness, food and baby stuff!!! These pictures are killing me! She is too cute!!! Love that she likes salmon, too! seriously! i feel like her purpose in life right now is to try and injure herself. I think as soon as she’s a steady sitter and can easily transition between sitting and crawling positions, switch her to the big tub! 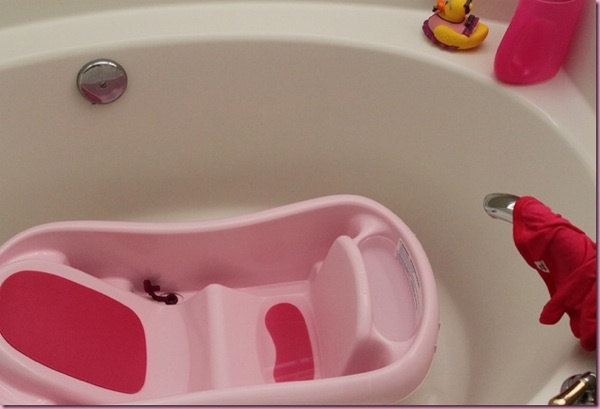 You will be amazed at how much joy bathtime can bring when she gets to kick and splash and play in that “big” tub. A lot of companies make them, but this is the one we have and love. We also tried the Boon Flo and threw it out because it got moldy. Anyway, brands aside this thing is a lifesaver because it prevents them from bonking their heads on the spout. I would also recommend taking baby swim lessons. I learned tons of things I could do to help my little one be more comfortable in the water, and I see a huge difference between my daughter (who didn’t take the class) and my son. Anyway, the baby swimming stuff will teach you a lot of things you can do in your bathtub so she won’t be afraid when she gets older! Your baby is adorable. I’m not able to have children due to health reasons. There was a time when I couldn’t look at baby posts. A couple of years down the childless track I’m now doing ok..I love to read about Olivia and how she’s changing..I feel like I’m not missing out completely…I just wanted you to know you’ve helped heal a broken heart …thank you ? thank you so much for reading, natalie. It’s amazing how fast she’s growing! You’ve done a great job and I love your updates here! it’s funny because i was bald until i was a year old- she already has way more hair than i did! I love how she says nana and baba because my grandparents are called nana and baba! Have you ever tries puffs? When I’m with my niece and nephew (who are 2 and 11 months) we eat puffs together! They are so good! 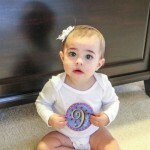 I totally understand you not wanting to post as much as she gets older, but I’m going to miss all the cuteness!!! She is just sooo adorable! My niece is 3 now, but has lived overseas since she was born, so I never really got to see her grow. I feel like the adorable pictures of Liv sort of makes up for it 🙂 Love the monthly updates! She looks so much like you! What a beauty. I think it’s hilarious that she is addicted to Zumba music and likes all the same foods you like. What a cutie pie. She is super cute! I would say you are safe to shed the baby bath tub now, especially if she is trying to figure out walking. My little guy has always loved baths but he enjoyed them even more after being out of the little tub! thank you- i’m going to give it a try after i can get the nonstick tub liner thing. i’m excited! She is such a doll! 🙂 It’s crazy how fast they grown up. I feel like I was just reading your birth story and now she’s moving and such an independent little lady! It’s amazing how similar your experience is to mine, right down to the likes and dislikes (with the exception of Jillian Michaels. ha). When my daugther started to move, we used to take a nightly walk. She loves it and it is a great time for her to relax…and for us to get a break from the constant chasing. We also got a baby corral. We mostly got it for my mom and sister because their houses weren’t babyproofed and it would have been too hard on them to watch her. She doesn’t love it, but it gives her much more room than the pack n play, which we also used in the mornings for a few minutes of sanity before she is off exploring. I think that was about the exact time we started putting her in the bath. We just kept the water rather shallow. I think Livi will love it. It sounds like she is very strong and i think she’ll have no problem playing safely. I definitely recommend getting a soft/spongy bath mat that sticks to the tub. They can be really slippery and it was scary! So precious! I love that personality stage and can’t wait to see my own little one get there. Suddenly everything starts to become so clear, adamant likes and dislikes, giggles, interests… amazing! Thanks for sharing Gina! Have you thought about getting the foam tile squares to put on the tile? They definitely don’t go with any decor but they are great for a baby. I babysit a friends 9 month old last weekend and they have hard wood floors but have the foam tiles. 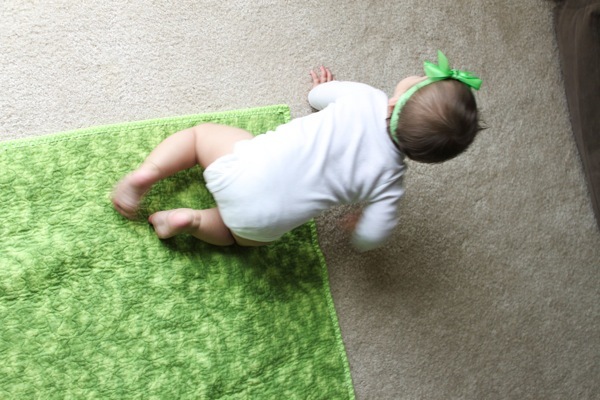 It was great for the baby because when he lost his balance and fell over, it was comforting knowing that he had a softer landing. You can always take them up if you have company coming over. I promise you – I don’t say this, hardly ever (probably not enough) but she is absolutely a beautiful baby. I don’t have any little ones for myself but I get really excited when you post about her. That first photo in the post is stunning! I don’t know if your doorstops are different, but the ones at my house had detachable little rubber “nubs” at the end to keep from scuffing the walls, and when my sister was a baby she would pull them off and try to eat them. 🙁 We ended up taking all the nubs off the doorstops, just so we had one less choking hazard. It’s so funny, almost every baby I’ve known has been absolutely fascinated by those doorstops! The doorstops are a GREAT kid toy, just pull the cap off. No cap, no problem. 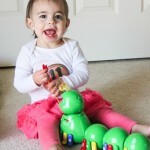 I’m glad someone posted this, I was going to and decided to scan the comments first… it’s a great sensory toy. good to know, i’ll definitely take the caps off! Hilarious that she hates Jillian Michaels podcasts! She is such a doll! My daughter also loves green veggies, or any veggies really haha! Now that she’s old enough her favorite thing is steamed broccoli which everyone thinks is weird but I just say she’s just like her mama and smile 🙂 As far as baths go I think she’ll have an absolute blast in the tub without the baby bath because I’m sure you’ll be thought there to catch her if she decides to go “swimming”. Ooh and good luck getting wearing Liv one she learns to walk, Sophia was literally crawling out of her wraps around 10 months because she wanted to get down and walk so badly haha. i make pancakes for my little guy once a week and they last a few days. i started doing this when he was around liv’s age because he went through a stage where he only wanted finger foods, no spoon fed stuff. i mix 3/8 cup oatmeal cereal, 1/4 cup whole wheat flour, 1 teaspoon baking powder, a lot of cinnamon (i don’t measure, just dump it in 😉 ) together. then add 5/8 cup milk (i used almond milk before he was a year and alternate between almond and cow’s milk now but you could use any type of liquid you like such as formula or breast milk) and 1/2 flax or chia egg. 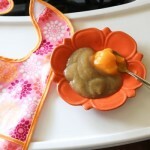 add in a container of baby food for a little sweetness and yummy flavor. now that my little guy is older i use chunks of fruit but he loves it either way. mix it all together and cook like you would any other pancake. i hope you like it if you give it a try!! oh, and for the bath tub thing, i was nervous to stop using our baby tub so i bought a little rubber mat to put in the bottom to help with him slipping. and then just had to be super careful for a while until we both got comfortable with it. i think i found the rubber thing in the baby dept at target. 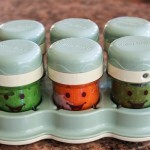 Amazing recipes for babies, toddlers and the whole family. She has some great pancake recipes too! I loooove the photos and the tidbits! My favorite photo is Olivia playing with her puzzle. She is so adorable and pretty! Sounds like she’s a milestone super star too. 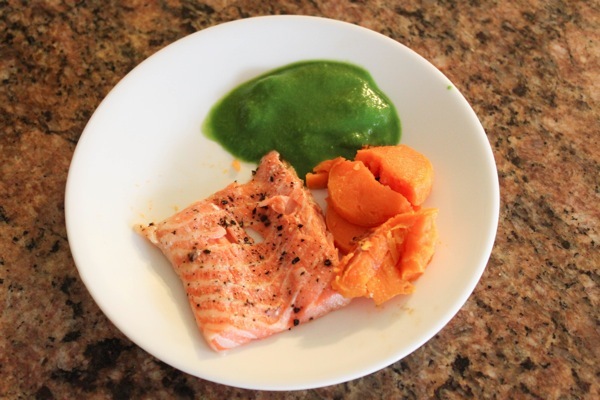 Ours was picky at that age, but now he enjoys most of the same healthy foods we do. I think his list of favorites is quite similar to Olivia’s. Every now and then one of his friends will convince him some vegetable is disgusting, but he gets over it pretty quickly. Happy 8 months 🙂 As I first glanced through the photos, I could have sworn Oliv was doing a little side plank in the second picture down. Like Momma like baby! She is precious! You can take her out of he baby tub. As long as she can sit up on her own she can go into the big tub:)! She’s adorable! It’s crazy how much difference a few months can make with a baby. 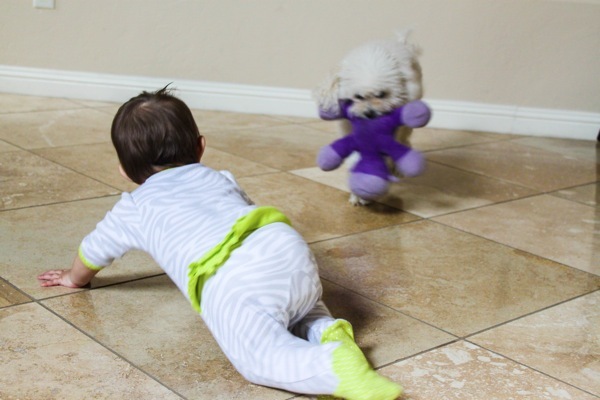 The Jillian Michaels thing is hilarious – apparently, babies are not her biggest fan. She is too precious!!! I used to like fish when I was a baby too. 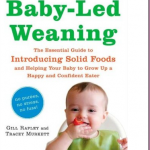 She’ll grow up with great eating habits especially with you guiding her! I think we stopped using the baby bath tub around 2 1/2 – 3 months so I say go for it! My son loves the water and baths are one of the best times of our day. Favorite toys for the bath are boats, duckies, and the bubble wand and bubbles from Gymboree (they are seriously the longest lasting bubbles ever). I love blowing bubbles for him in the bath tub because then I don’t really worry about him getting too much bubble solution on his hands (from popping them) and then putting them in his mouth- he also doesn’t have to compete with the dog who goes nuts for bubbles if I blow them around the other areas of the house. My son also likes the bath crayons, but it was probably more around 13-15 months that he got into those. I concur that Olivia should be able to comprehend and act accordingly if you ask her to sit down or you will take her out. Not that she won’t try (or try every single time you put her in the tub- haha, let’s be real! )… but you just have to keep on it. If you have a porcelain tub I would definitely recommend a mat or the decals that you stick on the bottom- ours is super slick! Good luck and have fun! We just switched to the big tub right as my son turned 8 months because all he was doing was standing and the infant tub wasn’t working anymore. We had a we had a few slippery baths and then I got a $10 non slip mat at bed, bath and beyond and it’s helped immensely! My guy loves bathtime even more now – he chases the toys all around the tub. It’s cute! I bought a no slip tub grip mat at Target that is purple with suction cups (in case you’re looking). It’s really soft and keeps Olivia (our Olivia ;)) from sliding all over the place. It’s super easy to pull up after bath time too. I hope you find something that works for you. If you thought she was splashing before, wait until she has the whole tub. I’m soaked by the time she’s turning into a prune and it’s time to get out. Bath time is our favorite too. Love the post! P.S. I made your dijon chicken with sundried tomatoes and quinoa last night and it was fantastic! Thanks for all the recipes! You’re breaking me out of a rut! Have a good one! OH MY GOODNESS the Jillian Michaels thing made me laugh so hard! I guess you either love her or you hate her hahah. She looks precious Gina! After the baby tub i transitioned to one of the sitting positioned seat things that suction to the bottom of the tub (great description right? ;-)). They have a bit more freedom in them but some security so they dont as easily fall under the water. SHE IS AMAZING!!! She seriously gets more beautiful with each month! I know, I know, it’s impossible. Thanks for sharing the Olivia’s progress!